Moses B. Russell (1809-1884), a native of North Woodstock, in the White Mountains of New Hampshire, worked for 50 years as a miniaturist, portrait painter and later as a daguerreotypist. He went on to become one of the most celebrated miniaturists of his day working out of Boston, New York and Maryland, sharing a studio with Sumner, his brother, and later with his wife, Clarissa Peters who was a well known artist in her own right. As Moses Russell became more established in the Boston artistic community and more confidant in his abilities, he actively contributed to the various art exhibitions in the city. His miniatures, as well as his wife's were displayed at the Boston Athenaeum (1834-1836 and 1838-1846), the American Gallery of the Fine Arts (1835), and the Boston Artists' Association (1842- 1844), of which he was an original member along with Washington Allston (1779-1843) and Chester Harding (1792-1866). (11) The triennial fairs of the Massachusetts Charitable Mechanic Association in Boston attracted citywide celebration and fanfare, and Russell entered miniatures in 1841, 1844, and 1847. As he gained considerable publicity from these exhibitions, Russell also found favor with newspaper editors, particularly those at the Daily Evening Transcript, who regularly lauded his latest portrait in their pages. Over the course of the 50 years in which he was active in the art community his style underwent noticeable changes so his earlier work differed slightly somewhat from his later, but overall the body of work continued to exhibit a wonderful charm and is readily identifiable and attributable to him. 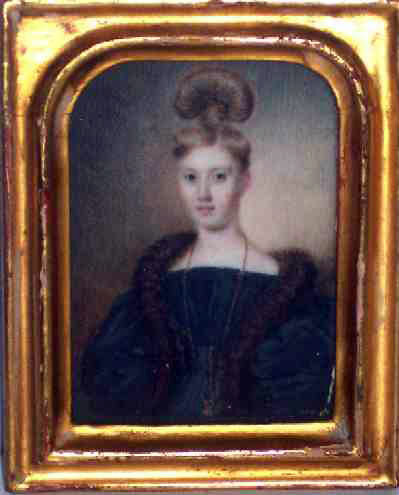 In 1839 he married miniaturist Clarissa Peters who worked as Mrs. Moses B. Russell. From then on they worked jointly, and their works are often mistaken for one another. Additionally, it is probable that he signed many works painted mostly by her. It was truly a man's world then! The Miniature Portraits which we present here are obviously of a family of means . . . Oliver Selwyn Felt, born in Wrentham, MA on May 29, 1811 and his wife, Mary Tyler Brown Felt, born April 8, 1813. 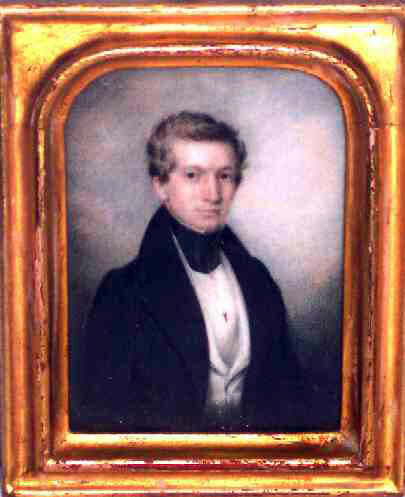 They were married on January 13, 1835 and most likely these portraits date to that time judging from the apparent youthfulness of the subjects and the fact that Oliver Senior died in March of 1838. There is a later, smaller miniature of their son, Oliver Selwyn Felt, born May 2, 1836. 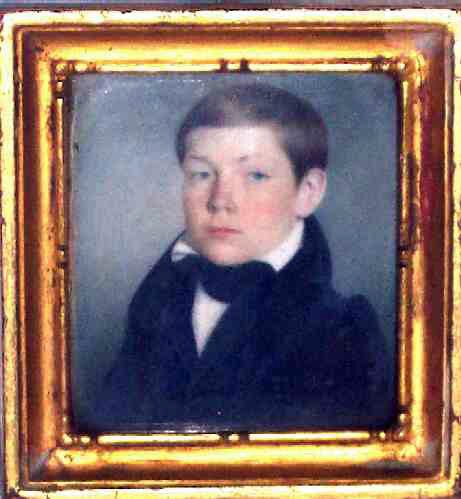 The child most likely was painted in the early 1840 s judging from his youthfulness. After Oliver died, Mary married William Fox Richardson (February 4, 1865) and died on June 2, 1896 at the age of 86. Miniature Portraits by both Mr. and Mrs. Moses B. Russell are among the most sought after by collectors. These are framed in lemon gold frames with brass hangers that are stamped Foster Bros. Boston. The two larger measure 2-1/4" x 3-1/8" (sight) and the smallest is 1-3/4"x 2". How wonderful to have one miniature by Moses B. Russell, but to have both the parents and the child is truly outstanding and will be the keystone of any collection of Portrait Miniatures!